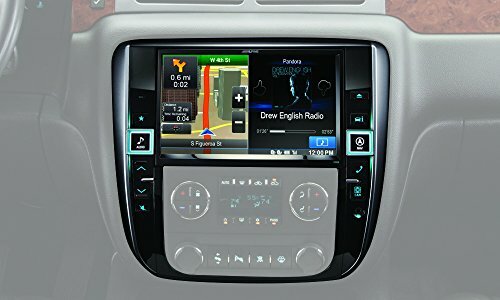 The X009-GM is a 9-inch Restyle dash system Alpine engineered for select GM trucks 2007-2013 and GM SUVs 2007-2014 (trucks and SUVs with lower dash radio model). The system consists of the screen and a fitted dash bezel for a factory look. Large back-lit buttons give you direct access to the most-used features like audio sources, navigation, and Bluetooth hands-free calling. The X009-GM’s audio, video, navigation and Bluetooth features are controllable through the touch screen. Audio sources include an HD Radio receiver, iPhone and iPod music control through the “Made for iPod and iPhone” compatibility, audio streaming, Pandora control from iPhone and Android smartphones, and compatibility with SiriusXM (separate tuner and SiriusXM subscription required). Video features include a WVGA screen and an HDMI input for connectivity to HDMI-enabled devices. The navigation maps cover the U.S., Canada, Puerto Rico, and the Virgin Islands. View your maps in full or split screen mode, and see the congestion ahead with the free lifetime HERE Traffic RDS service. Make or receive calls using the Bluetooth wireless technology. Answer calls through the touch screen or bezel, view caller ID on the screen, and play your call through your truck’s speakers. The X009-GM retains select factory controls and features like OnStar, steering wheel controls and warning chimes. View vehicle information like tire pressure, battery voltage, and user selectable gauges on the screen. Use the “My Favorites” feature to customize a quick-access screen with shortcuts to your most-used features like audio sources, frequented navigation destinations (“Office,” “School,” etc. ), and the favorite people in your phone’s address book. The X009-GM is authorized to be Sold By and Shipped From Amazon. For professional installation, visit the store locator on the Alpine USA website to find an authorized Alpine retailer near you.